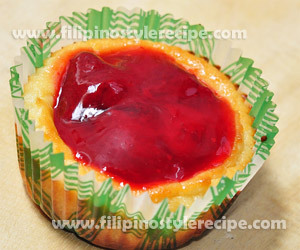 Filipino Style Recipe: Strawberry Cheese Cupcakes is a mouth-watering dessert that can be served in all kind of occasion. 1. In a bowl, mix together the crust ingredients until well combined. 2. Grease muffin pan and line with muffin cups. 3. Scoop a mixture and press into the the bottom of each muffin cup. 4. Bake in preheated oven at 300 degrees Fahrenheit for 5 minutes. Remove from the oven but keep the oven on. 1. In a mixing bowl, beat cream cheese using an electric mixer until light and fluffy. 2. Gradually beat in the condensed milk. Mix in lemon juice, lemon zest, and vanilla extract. 3. Beat in the eggs at low speed one at a time until just combined. 4. Add the flour and beat again. 1. Pour the cream cheese mixture into the muffin cups until 2/3 full. 2. Bake for 25 minutes without opening the oven. 3. Let it cool completely then place scoop of strawberry filling. 4. Refrigerate for at least 4 hourse until ready to serve.